In the book Lifelong Kindergarten, written by learning expert Mitch Resnick he suggests that the rest of school (even the rest of life) should be more like kindergarten. The main premise is the book is the idea that in order to thrive in today’s dynamic world, people of all ages must learn to think and act creatively —and the best way to do that is by focusing more on imagining, creating, playing, sharing, and reflecting, just as children do in traditional kindergartens. The book is structured around the four P’s: Projects, Passion, Peers, and Play and the important role each plays in cultivating creativity. This is a book that speaks to me from beginning to end. If you know me or have read any of my previous blog posts, you know that the second P-passion, is a topic I am personally “passionate” about, so much so that it inspired the name of my blog, “The Meaning of Meraki”. 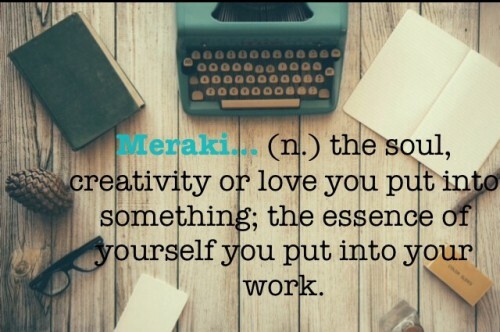 Meraki is a Greek word defined as “the soul or creativity you put into something; the essence of yourself you put into the work you do.” Although there is not quite a direct English translation of the word “meraki”, the closest we can get is the word PASSION. Leading a life filled with meraki or passion is a gift. Definition-Passion: a strong liking or desire for or devotion to some activity, object, or concept or a strong enthusiasm or interest. If you know any kindergarteners, you can speak to the often unbridled enthusiasm they bring to all that they do. They are passionate about their learning; engaged, curious, and eager. Yet we know as students move up the grades this initial enthusiasm and interest in school often diminish. Research shows that as children advance through the grades engagement levels decrease significantly. The 2015 Gallup Student Poll, Engaged Today, Ready for Tomorrow defines engagement as student “involvement in and enthusiasm for school”. After surveying over 900 000 US students the study shows engagement levels steadily drop as students move from Grades 5-12. The poll indicates that while over 75% of 5th graders are engaged in school, this numbers steadily drops to 34% of students being engaged in their learning by the 12th grade. The Canadian Education Association (CEA) 2011 study looking at intellectual, social and institutional engagement in schools entitled, “What did you do at school today?” shows similar trends. These decreasing levels of engagement tell us something has to shift. How do move schools towards a culture in which students maintain a similar interest and passion for learning that they enter with in Kindergarten? One of the ultimate goals of schools is to prepare students for their future and the world of work. Starting in their early days of high school students begin to make choices that may determine their life path. They choose electives, course levels and vocational programs that may come to influence or determine whether or not they go to post-secondary education, whether or not they finish high school and what direction life may take them. Sometimes they get it right and sometimes they don’t. But what if this were different. Imagine if schools were places where starting from an early age, students were regularly given opportunities to discover and uncover their interests, skills, strengths, and passions…. In the book Lifelong Kindergarten, Mitch Resnick, creates a spin-off of a Ben Franklin quote to make his own suggestion, “An investment in interest always pays off with the best knowledge”. When we invest in our students and give them time to be creative and the opportunity to uncover their passions and interests, we allow them the chance to develop insight and knowledge about themselves, and we allow them the opportunity to invest in their own future. Imagine if all schools honoured more student voice and choice when structuring learning opportunities and learning was, in turn, more personalized, active, student-driven and gave students the chance to explore something they may ultimately become passionate about. More and more classrooms at varying levels utilize a Genius Hour kind of format which allows students time to explore their own passions through maker space or project-based learning initiatives which encourage creativity and student-driven learning in the classroom. Sue McFarlane Penner, a teacher in Winnipeg, Manitoba, uses a variation of this approach with her grade 1,2,3 multiage class. Her students develop “Workshops” on topics they are passionate about ranging from basketball to piano, to chess, to video making and in turn her students teach other students about their passions, including their older Grade 5/6 Learning Buddies. Not only do students have the opportunity to research and share their learning about something they are passionate about, they also learn presentation skills, communication skills and build confidence as young learners. Some places structure more personalized learning options for students to explore interests and passions using a school-based model. Ecole Garden Grove School also in Winnipeg offers a school-wide initiative called I.D.E.A.S which stands for Innovative Design Exploration Activity Stations. IDEAS provides students in grades 3-6 with the opportunity to explore personalized learning opportunities. It is a chance for all students and staff to have fun, while discovering, learning about, & creating new things. All learners have the opportunity to design, create, work together, try new challenges, take risks, fail and try again, all while building community and connections with students and teachers they may have never had the chance to work with before. IDEAS is scheduled in for two one hour slots, twice weekly and each block typically lasts for 4 weeks. Past focuses in IDEAS sessions have been on: Robotics, drama, pottery, electronics, clothing design/sewing, woodworking, coding, Lego 2.0, geocaching, comic book design, scrapbooking (Cricut), Little Bits, audio sound engineering, outdoor education, claymation/digital animation, magic, quilting, tinkering, photography, space/rocket science, batik, culinary arts etc. Workshops are determined based on student and staff interest. Staff plan and prep for their activity stations, students choose their top interests using Google Forms, groups are made and workshops begin. Reflection is an integral and critical part of the IDEAS initiative. Students are asked to reflect on their learning stations each session through the foundational educational tenets of the initiative including; 4 C learning (creativity, collaboration, critical thinking, and communication), having an innovative mindset and design thinking. This innovative initiative encourages both staff and students to step outside their comfort zone, try something new and potentially find areas they are passionate about. It has been embraced and highly valued by all stakeholders and also maintains great community support. Similarly, Lake Trail Middle School in Courtenay, BC offers personalized learning opportunities for its grade 8-9 students through electives and what is scheduled as Flex or Quest Time. The staff was surveyed and asked to create courses they thought would be meaningful for students and that fit their own personal skill sets. These electives (46 in total) range from the more typical options found in middle school settings related to athletics, art, music, foods, woodworking and textiles to a wide variety of more personalized options including: African & Aboriginal Drumming, Art Installation, Film, Audio Engineering, Global Foods, Gender Equity Alliance, Marine Biology, The Music Business, Cooking with Fire, Coding, and Community Leadership/Engagement to name a few. The Flex or Quest component scheduled into timetables gives students the opportunity to explore an independent project that they are passionate about that may or may not be connected to their chosen electives. To start the year teachers scaffold the thinking, planning and requisite skills needed to support this sort of individualized student work, and they serve as mentors as the work continues. Students are also connected with further mentors, if applicable, within the greater community. The teachers at Lake Trail were encouraged to expand their own learning and model risk-taking by imagining the possibilities, building on their own strengths or interests, teaching something they may have never taught before and facilitating learning using methods that were new to them. Through this expansion of available electives and increased exploration time, students were offered an abundance of personalized options, encouraged to take risks, explored new interests and developed a new valuable skill set as independent learners! In many ways, the 2 examples above may seem parallel to personalized learning initiatives such as Genius Hour, passion projects or Inquiry time, because they are. However, often those types of learning opportunities take place in certain classrooms and are driven by individual teachers. School-wide initiatives such as these two examples ensure empowering, personalized learning is in place for ALL students, develop common understanding across classrooms, and builds on independent skills throughout the grades in a school. Schools like High Tech High, Connect Charter, Big Picture Learning Schools, The Pacific School of Inquiry & Innovation, PROPEL and countless, countless others are imagining the possibilities and turning their innovative visions into realities as they look to alternative approaches to; school organization, programming, meeting standards and curriculum, assessment, and reporting . These types of initiatives all have one thing in common; a more student-focused approach to learning. There is much to be learned from the schools above and the plenty more like them. However, there are also many examples of schools and classrooms still stuck in very traditional, teacher driven, merely content focused models of teaching and learning. As suggested by Mitch Resnick, “finding the right balance between freedom and structure is the key to creating a fertile environment for creative learning”. We owe it to our students to find this balance. We owe it to our students to create learning environments where deep learning, and passion thrive. We owe it to our students to provide rich learning opportunities that allow them as individuals to explore and discover where their interests, strengths, and passions thrive. These learning environments may look similar to the ones outlined above, they may be an iteration of something parallel or they may be something brand new. The possibilities are endless and may vary greatly depending on the level, the learning context, and the learners themselves. Yet, ultimately all classrooms and/or schools need to find an entry point to ensuring both choice and voice are honoured for students in the form of engaging and empowering personalized learning options, in some way. Our students may not be passionate about everything in school, but they should be passionate about something. As teachers it is our job to help them discover their “something”.